Wait! You think all tire irons are the same?! They aren’t, and these can change your (tire changing) life. A review of tire irons, give me a break, right? They are all the same and most us moto guys don’t even change our own tires… Or maybe we do. It depends on what thread you read in the forum. Either way, I personally change my own tires and recently I had to put some mousses in for another product test coming up soon. Rather than my old skinny trail-pack tire irons, I figured I could use as much help as I could get since putting in a mousse by hand isn’t the smartest idea out there. Moose Racing kindly offered two different tire iron designs and I accepted both the Professional Tire Iron and the pair of TY-ER Irons. Big, heavy, and strong… just the kind of thing you want tire irons to be. These are definitely not designed to go in a trail pack, but the TY-ER Irons are small enough to fit in you track box. The Pro version might be a little big to take to the track depending on how big your track box is. I have a small, bare-essentials style tool box for my track days and the Professional Tire Iron takes up more room than I would like. There are two features of the TY-ER Irons that make them stand out as better than pretty much any other tire irons I’ve used. The first is the handle. This seems like such a small detail but when you need to really force a spoon down between a rim and a bead, having an actual hand-shaped grip to push against makes a huge difference, especially if your hands are covered in mousse lube. With flat or double-sided tire irons, it can be difficult to grip the iron tight enough to be able to really exert a lot of force. The handle also makes it easier to really yank on the iron after taking a big (maybe too big) bite of the bead. The second thing is the shape of the tip of the spoon end. Or I should say the thinness. Other irons I’ve used have a pretty blunt and thick spoon end that is tough to get between the tire and rim, but the TY-ER Iron’s spoon end is thin enough to slide in easily, but still thick enough to have the strength not to deform or bend. There is also a nice little curve at the end that helps the spoon grip the rim. Whether I was trying to get a bite of the tire to take it off the rim, or trying to bite the rim to get the bead on, I kept going back to the TY-ER Irons because of the slim profile of the spoon. 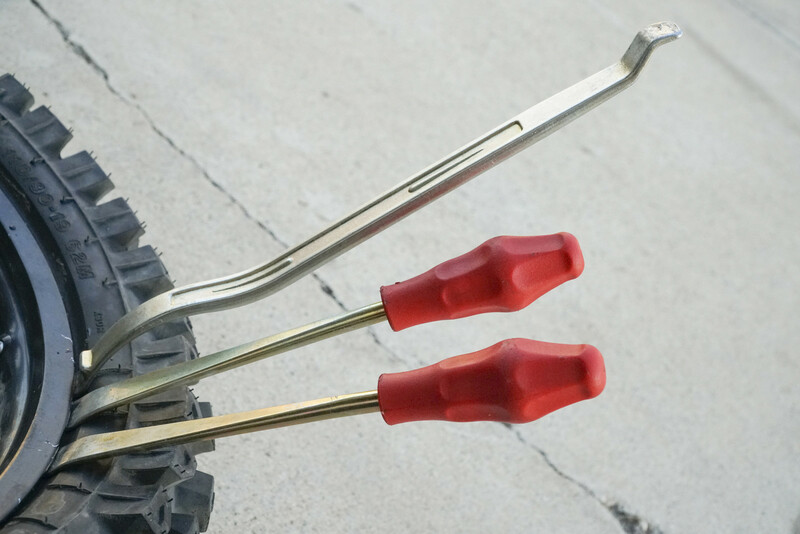 The Pro tire iron is a little overkill for normal tire changes, but vital for changing mousses. It is extra long to give to plenty of leverage and the large curved end lets you make the most of all that leverage. The end has a little tab that keeps the spoon from going too far into the rim and pinching the tube. Not that it keeps you from pinching tubes, it is just a helpful guide mark. 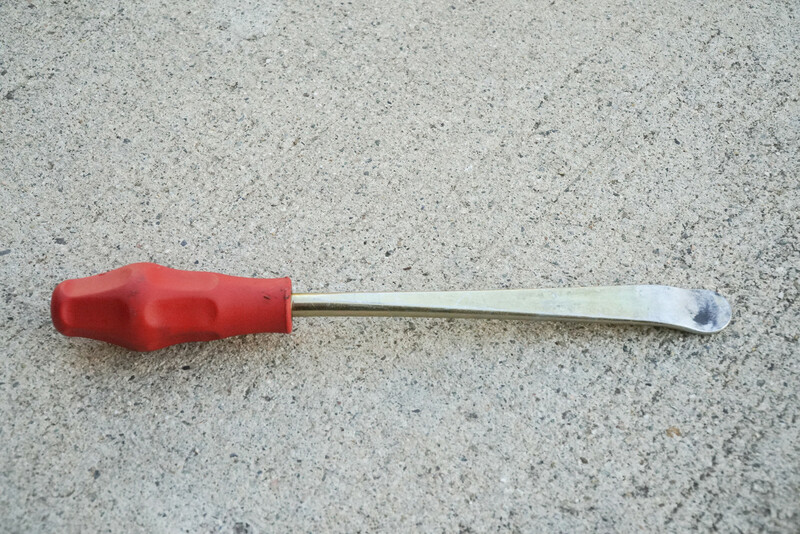 This tire iron is like the closing pitcher (I think, I don’t watch baseball), you just need it right at the end when you just need to get that last stubborn section of bead over the rim. I’ve used a wide, random assortment of tire irons over the years and these two designs from Moose stand out as the best of the bunch for me. While I hope I don’t have to change mousses ever again, I know that I can with these tire irons (and a few bead buddies). Having a solid pair of super useful and super comfortable tire irons can make changing tires so much less of a crappy job and maybe even inspire you to change your own tires if you don’t already.